Africa is home to the world's earliest known use of measuring and calculation, confirming the continent as the birthplace of both basic and advanced mathematics. Thousands of years ago, Africans were using numerals, algebra and geometry in daily life. This knowledge spread throughout the entire world after a series of migrations out of Africa, beginning around 30,000 BC, and later following a series of invasions of Africa by Europeans and Asians (1700 BC-present). The oldest mathematical instrument is the Lebombo bone, a baboon fibula used as a measuring device and so named for its location of discovery in the Lebombo mountains of Swaziland. The device is at least 35,000 years old. Judging from its 29 distinct markings, it could have been used to either track menstrual or lunar cycles, or used merely as a measuring stick. It is rather interesting to note the significance of the 29 markings (roughly the same number as lunar cycle, i.e., 29.531 days) on the baboon fibula because it is the oldest indication that the baboon, a primate indigenous to Africa, was symbolically linked to Khonsu, who was also associated with time. The Kemetic god, Djehuty ("Tehuti" or "Toth"), was later depicted as a baboon (also an ibis), and is usually associated with the moon, math, writing and science. Use of baboon bones as mathematical devices has been continuous throughout all of Africa, suggesting Africans always held the baboon as sacred and associated with the moon, math, and time. The world's oldest evidence of advanced mathematics was also a baboon fibula that was discovered in present-day Democratic Republic of Congo, and dates to at least 20,000 BC. The bone is now housed in the Museum of Natural Sciences in Brussels. The Ishango bone is not merely a measuring device or tally stick as some people erroneously suggest. The bone's inscriptions are clearly separated into clusters of markings that represent various quantities. When the markings are counted, they are all odd numbers with the left column containing all prime numbers between 10 and 20, and the right column containing added and subtracted numbers. When both columns are calculated, they add up to 60 (nearly double the length of the lunar or menstrual cycle). Although the oldest known evidence of the ancient counting board game, Gebet'a or "Mancala" as it is more popularly known, comes from Yeha (700 BC) in Ethiopia, it was probably used in Central Africa many years prior. The game forces players to strategically capture a greater number of stones than one's opponent. 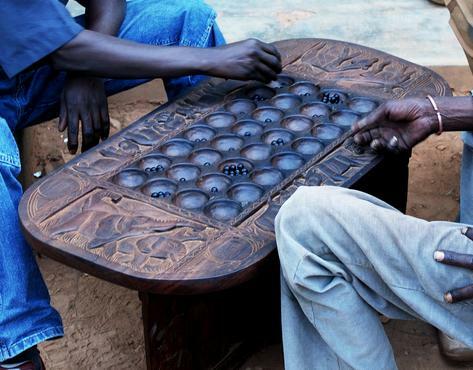 The game usually consists of a wooden board with 2 rows of 6 holes each, and 2 larger holes at either end. However, in antiquity, the holes were more likely to be carved into stone, clay or mud like the example from Medieval Aksum, shown at right. 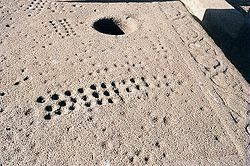 More advanced versions found in Central and East Africa, such as the Omweso, Igisoro and Bao, usually involve 4 rows of 8 holes each. A copy of the so-called "Moscow" papyrus in "hieratic" text, with a clearer rendering below in "hieroglyphs". Housed in Moscow's Pushkin State Museum of Fine Arts, the so-called "Moscow" papyrus, was purchased by Vladimir Golenishchev sometime in the 1890s. Written in hieratic from perhaps the 13th dynasty in Kemet, the papyrus is one of the world's oldest examples of use of geometry and algebra. The document contains approximately 25 mathematical problems, including how to calculate the length of a ship's rudder, the surface area of a basket, the volume of a frustum (a truncated pyramid), and various ways of solving for unknowns. "Accurate reckoning for inquiring into things, and the knowledge of all things, mysteries...all secrets... This book was copied in regnal year 33, month 4 of Akhet, under the majesty of the King of Upper and Lower Egypt, Awserre, given life, from an ancient copy made in the time of the King of Upper and Lower Egypt Nimaatre. The scribe Ahmose writes this copy..."
The first page contains 20 arithmetic problems, including addition and multiplication of fractions, and 20 algebraic problems, including linear equations. The second page shows how to calculate the volume of rectangular and cylindrical granaries, with pi (Π) estimated at 3.1605. Tere are also calculations for the area of triangles (slopes of a pyramid) and an octagon. The third page continues with 24 problems, including the multiplication of algebraic fractions, among others. 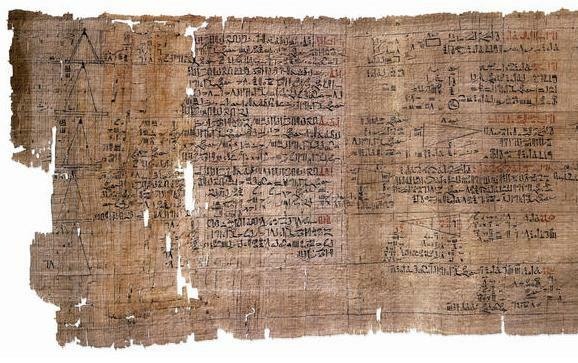 A page from the so-called "Rhind" Mathematical Papyrus in "Hieratic" text. 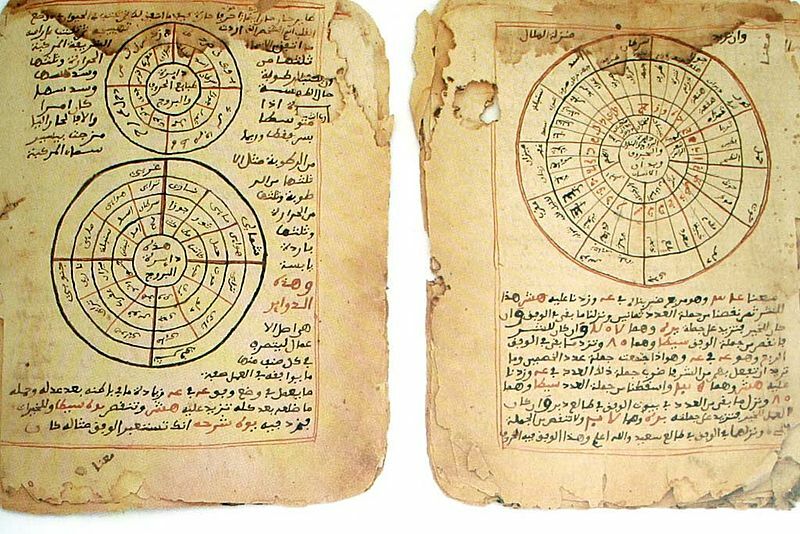 Timbuktu in Mali is home to one of the world's oldest universities, Sankore, which had libraries full of manuscripts mainly written in Ajami (African languages, such as Hausa in this case, written in a script similar to "Arabic") in the 1200s AD. When Europeans and Western Asians began visiting and colonizing Mali from 1300s-1800s AD, Malians began to hide the manuscripts in basements, attics and underground, fearing destruction or theft by foreigners. This was certainly a good idea, given Europeans' history of stealing and/or destroying texts in Kemet and other areas of the continent. Many of the scripts, such as the one shown below, were mathematical and astronomical in nature. In recent years, as many as 700,000 scripts have been rediscovered and attest to the continuous knowledge of advanced mathematics and science in Africa well before European colonization.